The Bible, the Midrash, and legend paint a picture of <?xml:namespace prefix = st1 ns = "urn:schemas-microsoft-com:office:smarttags" />Jerusalem, from the time of its bold conquest by King David and up to its destruction by the Babylonians, and they provide us with descriptions of the great kings who ruled over the city. Archeologists, who have been excavating the city for decades, have found inanimate evidence of past events that often raises many new questions. We will embark on a tour amidst the layers of the past, tracing the tracks of kings, writers, and prophets who roamed through Jerusalem in its early days. We will learn about morality, justice, and leadership and explore the relevance for our modern life of stories that were written generations ago. Among the questions we will seek to answer: Why was David a redhead? What did Solomon see on the Queen of Sheba’s feet? Who is “the bird in the cage”? 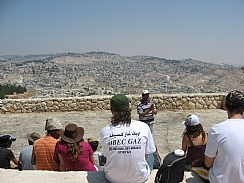 The sites of the tour include Armon Hanatziv Overlook, the City of David, the Ariel Center for Jerusalem in the First Temple Period, the Broad Wall of the Old City, and the Israelite Tower.